For all former pint-sized Picassos who got in trouble for doodling during class and who’ve grown up to be drawn to drawing during business meetings, the non-profit Chesterfield Arts organization of Chesterfield, Mo., has news you’ll want to hear: Doodling is good for you. 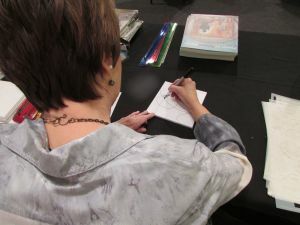 At a recent “Doodle Party” – a Chesterfield Arts “Art Uncorked Workshop for Adults” – teacher and professional artist Mary Beth Shaw of Wildwood, Mo., cited a Jan. 19 TV segment on “CBS Sunday Morning” that touted the benefits of doodling, including a 2009 research study published in the “Applied Cognitive Psychology” journal. Volunteers were played a boring voicemail with some asked to doodle and others just to listen. The study found that doodlers remembered 29 percent more details from the voicemail than the non-doodlers. Shaw has doodled for years during airplane flights or while watching television at home. Her favorite rigid medium for doodling is a piece of Fome-Cor® board cut with a sharp artist’s knife to a purse-sized 6-inch by 6-inch square. She decorates the Fome-Cor board with a black Identi®-pen permanent marker by Sakura. Fome-Cor board by 3A Composites USA was the first foam board on the market and is still the board that graphic artists’ ask for by name. It consists of extruded polystyrene foam bonded between various high-quality papers that feature a smooth surface for decorating. Fome-Cor board is lightweight, rigid, warp-resistant and easy to cut. Fome-Cor board is available in the 1/8-inch, 3/16-inch and 3/8-inch thicknesses in standard sheet sizes ranging from 20 inches by 30 inches to 60 inches by 120 inches. Shaw – who donated her time to help a class of 14 students learn to doodle – said it’s important for adults to participate in the creation of art because it’s something that we all start out doing as kids. She recalled her young nephew’s comical remark when she told him several years back that she was returning to school to learn to draw. 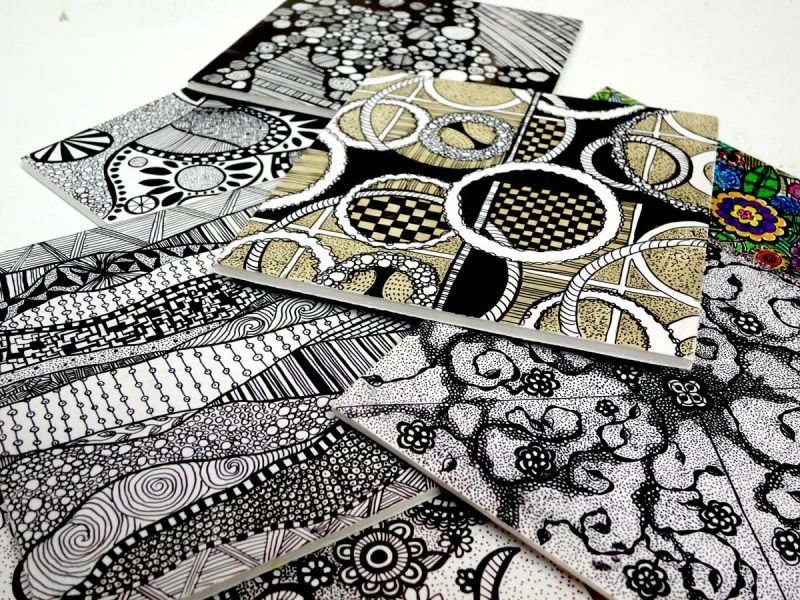 To make the doodling process even more simple than free-hand drawing, Shaw encouraged students to incorporate unique shapes into their doodle art by tracing some of her StencilGirl stencils. 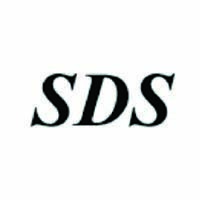 Chesterfield Arts provides quality and diverse programming in the visual, performing, and literary arts, promotes public art and arts education, and serves as a resource for arts information in the West St. Louis County (Mo.) region, according to the organization’s mission statement. 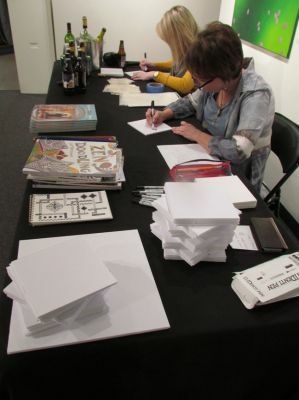 Donations – such as the Fome-Cor board provided for the “Doodle Party” – are always appreciated by Chesterfield Arts, according to Spiller. Image 1 – Doodles on Fome-Cor® board created by teacher and artist Mary Beth Shaw. Image 2 –Artist Mary Beth Shaw doodles on Bright White Fome-Cor® board by 3A Composites USA with a black Identi®-pen permanent marker by Sakura. 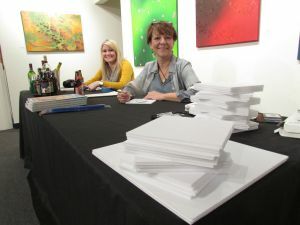 Images 3-4 – Teacher and artist Mary Beth Shaw (front right) and Chesterfield Arts’ Annie Spiller doodle on Bright White Fome-Cor® board by 3A Composites USA at a recent “Doodle Party” – an “Art Uncorked Workshop for Adults” – at Chesterfield Arts in Chesterfield, Mo.